I hope everyone had a great Christmas holiday. Today's ink is Diamine Golden Ivy. I purchased my sample of ink at Vanness Pens. Golden Ivy is part of the Diamine 2017 Shimmertastic Collection. Golden Ivy is a medium green with dark pink sheen and gold shimmer. 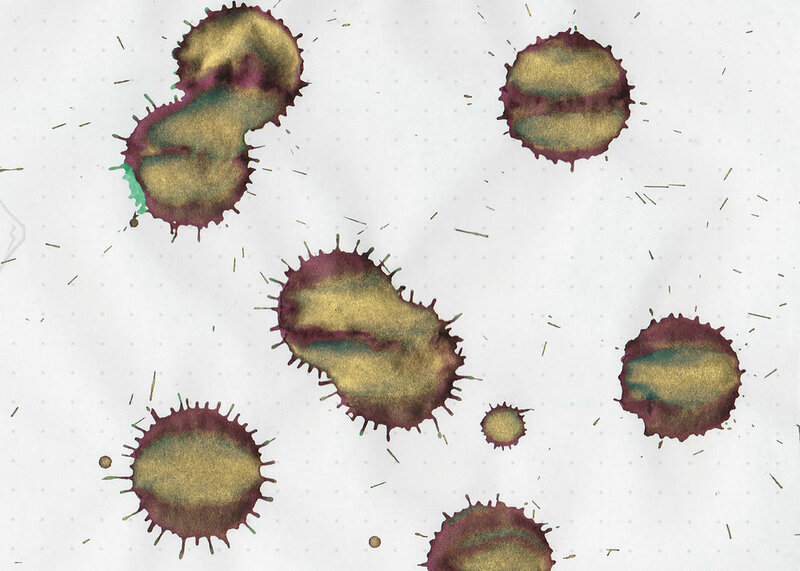 In large swabs the ink looks very dark green, the sheen is so dark pink that it almost looks red, and it has a ton of gold sheen-it looks like the perfect Christmas ink. I love these ink drops-so much shimmer and sheen. Other properties: Medium shading, medium pink sheen, and gold shimmer. There was a little bit of feathering on 20 pound copy paper, but other than that the ink did well. Ink swabs for comparison, left to right (top to bottom for mobile RSS): Robert Oster Emerald, Diamine Golden Ivy, and Robert Oster Peppermint. Click here to see the Diamine inks together. Robert Oster Green Diamond, Robert Oster River of Fire, and Diamine Dark Forest. Click here to see the green inks together. I used a broad Forest Green Conklin Durograph on Tomoe River paper. The ink had an average to just slightly dry flow. I didn't have any issues with shimmer clogging the feed. Overall, I feel like this is the perfect Christmas ink. It is just a touch dry, but as long as you use the ink in a slightly wet pen you shouldn't have any problems.